Let your students practice exponents, fractional exponents, and roots with this powerful assignment that asks them to compute impressive mathematics in their heads. 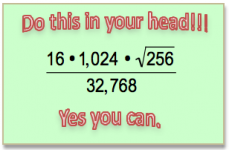 then you can ask students to calculate all kinds of amazing math in their heads. It's like magic!